View Work Trips 1997 - 2004 & Mexico February 2001 on GregW's travel map. One week ago, I was putting on a t-shirt to go to bed, and heard the sound of ripping. I pulled the shirt off, and saw that the small tear on the back had torn across the entire shirt. "Damn," I said. "That was my favourite t-shirt." Not only was it comfortable, and had a big hockey puck on the back, but it was one of my favourite travel souvenirs. I don't often bother with souvenirs, and very rarely come back with anything I have purchased. Occasionally, though, there is something that captures the essence of my travels. Generally, it is something that I had with me throughout my travels rather than something that I picked up. When those things break or wear out, they desire a more fitting send-off than just being thrown out with the day's trash. For example the poem to my broken roller bag or a post about my shoes. I never travelled much before I headed down to Denver in 2000 for work. I'd been to a few places in Canada and the USA, but really didn't understand the big deal about travelling, or living abroad. I had liked Toronto, and didn't see much point in leaving it. I had just left a job that I didn’t like so much that I was pretty sure it was making my physically ill. My stress level certainly was quite high. I was still dealing with the death of my mother less than a year earlier, and my family was in transition as they learnt to interact in “the new normal.” I was out of shape. I was having trouble with relationships – both with women (which hasn’t changed) and also with my friends. I was angry a lot of the time. All very different problems, but all connected in a very important way. They all took place in Toronto. The air was heavy with the ghosts of my recent past. I felt trapped in the city. I felt like I wanted to change, that I wanted to be a different person than I was, but it was too hard. It’s much easier to just fall into familiar roles when confronted with familiar people and places then it is to try and change. It’s too confusing for the people you deal with and it’s too confusing for you. I was asked to get on a plane and fly to Denver for a short project. I stepped off that plane and felt like a heavy weight was lifted off my shoulders. Denver was geographically and architectural different than Toronto, with it’s mountain backdrop, lack of significant bodies of water, wide streets and shining sunshine. Nothing looked the same, and I didn’t know a soul. I was free to act however I wanted to, not to just fall into the familiar roles of the past. It allowed me to re-invent myself completely. Denver, sunny and warm in the summer, was the perfect remedy for my aliment. Sometimes, as they say, a change is as good a rest. I would argue that a change could be better than rest. Not only was it just that Denver was new to me, it was also just new in general. That's not to say that Denver doesn't have much in the way of history, because it does, but architecturally most of it is recently built, or at least recently renovated. I lived in the area called LoDo (lower downtown), which was a mix of new buildings and renovated warehouses. I had an apartment that looked west, over Mile High stadium and at the Rocky Mountains, which shone bright in the morning as they reflected the rising sun, and provided a dark, jagged-toothed grin as the sun set in the evening. Two blocks from my apartment, in one of those reclaimed warehouses, was a sports bar called the Sports Column. I would usually find my way down there a couple times a week where I would pull up a stool at the bar, watch baseball, football (American, of course) or hockey on the big screens while eating they really tasty chicken wings. It was the start of what would become my bizarre focus on Superbowls Around the World and was the first bar that I had that felt like a "local" to me. I'm not alone in this feeling, by the way. The Sports Column has been named as one of the best sports bars in America numerous times, including being one of the top 10 Baseball Bar & Grills (as per ESPN.com) and one of the top 20 Sports Bars In America by Sports Illustrated Magazine. 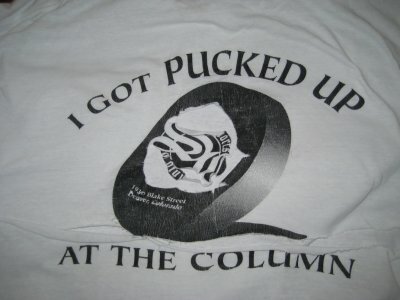 The t-shirt I won one night during a hockey broadcast, exactly how or why I no longer remember, but I wore it proudly. Over the years, as it ripped and tore, it was relegated to the being worn only to bed and on lazy days hanging around watching TV, until its garment-ending tear that occurred last Sunday. It made me sad, not because I don't have a number of other partially moth-eaten t-shirts to take its place, but rather because it was always a reminder of the start of what would become my desire to live abroad. I'm sad to see the t-shirt be turned into rags, but at least it got to live long enough to see me fulfil the dream to live abroad that was incubated into life in Denver. 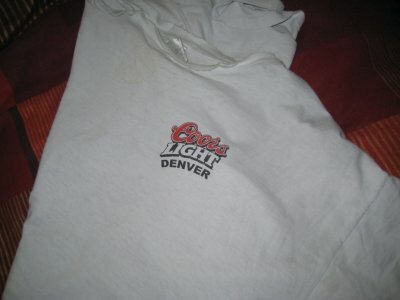 ...And, of course, all that means is that some point in the future, I will have to make sure to make it back to Denver to get a new t-shirt from one of the best sports bars in America. Save a seat at the bar, flip to the Colorado Avs' game on the big screen and put in an order of hot wings for me.